It might be difficult to overthrow Google’s YouTube as the undisputed champion of online video searches, but software behemoth Microsoft has just found a way to threaten that spot by improving the video search capabilities of its search engine, Bing. Microsoft executed the finishing touches of its Bing video search feature just this week, and we have to say that the final product looks immaculate. If you intend on using the search engine in the foreseeable future, then boy does Microsoft have a few amazing surprises to completely bedazzle you. According to the information present on Bing Blogs, the following changes have been made to give the video search engine a proper makeover. We increased the size of the video thumbnail in our search results, giving an expanded view of the video and making it easier to find the video you want to watch. Additional information has been added to the video search page like channel, upload date, and view count. When you search for a song, we display an enlarged thumbnail image, or “hero”, for that song. The hero is chosen based on the top result and relevance to your search. The hero video will play in place or you can click through to the source of the video to watch it there. All of the related searches have been moved inline with your original search, so as you scroll through the page you’ll have some ideas of what to search for next to help refine your search results. When you hit the bottom of the page, you’ll get even more suggestions and the option to see more video search results. These updates improve touch-friendliness and scale better to tablets and other smaller screens. Perhaps the biggest change out of all of them happens to be grabbing results from places not featuring the YouTube URL. 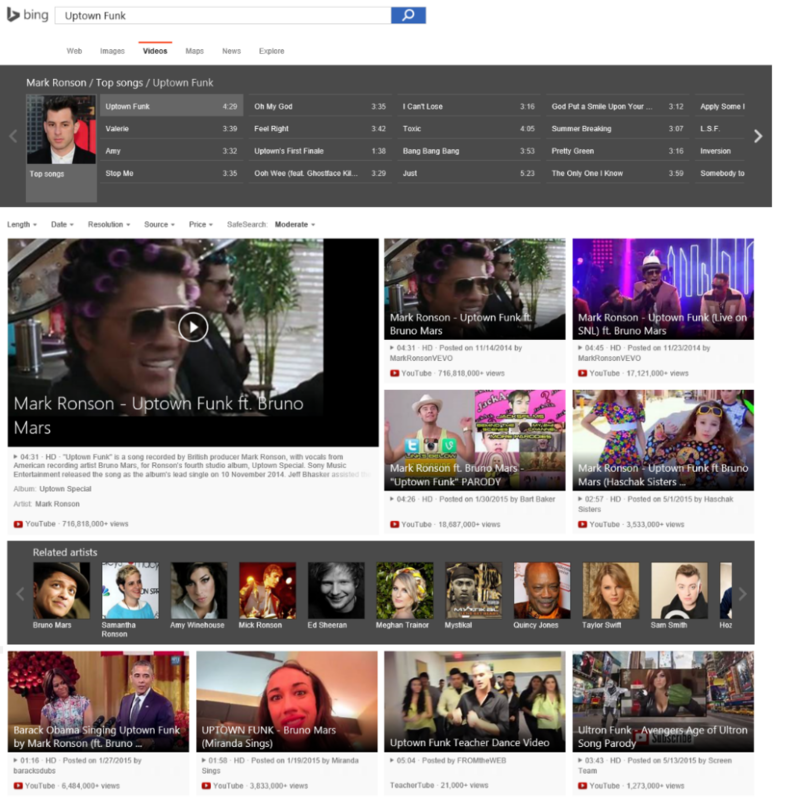 While Google’s own video search tool on google.com delivers an abounding number of results from multiple sources, the feature is outdated and lacks several others which are present in Bing’s latest update. We are confident that Google will not be taking this change lightly and in the foreseeable future, we might see a string of changes on the advertising giant’s video streaming website. The post Microsoft Makes A Much Better YouTube Search Engine Than Google by Omar Sohail appeared first on WCCFtech. Next article15 Essential Gadgets for Your Leisure Time.